Presentation of the best lightweight travel trailers on the market; top 10 models that deliver luxury and provide ambiance of the “home away from home”. The tiny-house movement combined with a renewed fascination with getting outdoors and into nature has fostered a renewed interest in smaller, more lightweight travel trailers. 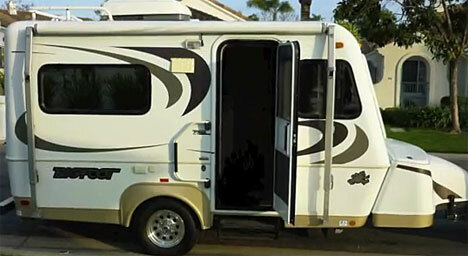 Higher gas prices has also pushed many RV veterans into searching for smaller rigs that will save them money on filling up without costing them the amenities they're used to. Luckily, the manufacturers of lightweight travel trailers are beginning to take note of these changes. 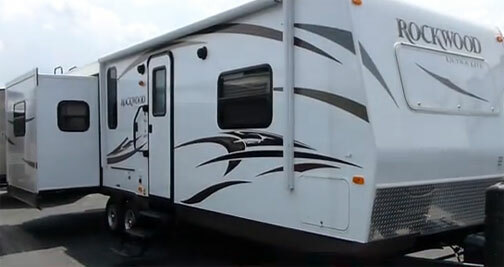 Lite-weight campers are becoming the “must” in product line of any serious RV manufacturer. Some specialize in bringing down the weight by a combined effort of using lighter materials, cutting on wood (it is heavy) and reducing camper’s size; however there is also a strong trend to reduce trailers’ weight without compromising the “luxury” of the “home away from home”. Below are our picks for the best lightweight travel trailers on the market representing the latter class of RVs. 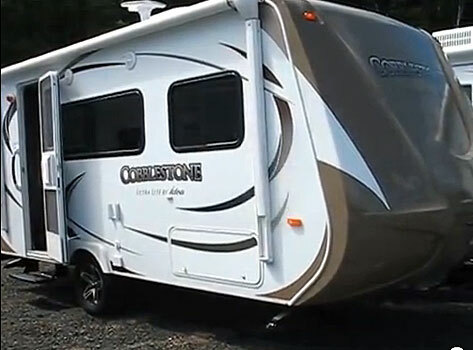 The Travel Lite Cobblestone offers floor-plans that range from 15' to 23'. Dry weights for these trailers range from as low as 2,500 pounds up to 3,000 pounds. Still, you won't feel like you're traveling without; amenities include 19” flat screen TVs, cherry cabinets, three-way refrigerator, two-burner stove-top, built-in microwave, and beveled-edge hardwood floors. 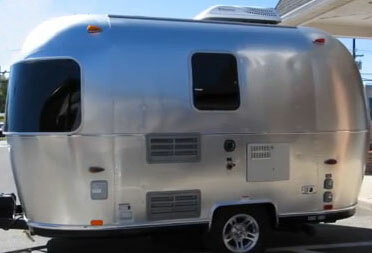 Airstream has been in the business of building travel trailers for more than 75 years. With a dry weight of only 2,900 pounds for their 16' model, the Airstream Sport still manages to offer a number of high-end features. You can choose between having a front bed and rear bath, or for a bigger sleeping space, opt for the rear bed with a wet bath configuration. Other features include tinted panoramic windows, stainless steel sink, and a removable under-bed storage system. 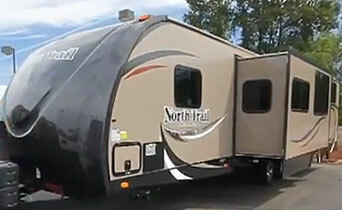 This Canadian manufacturer offers travel trailers built from molded top and bottom fiberglass shells. This allows them to be lighter than other trailers of comparable size; the 17' model has a dry weight of only 3,100 pounds. High insulation values combined with ducted furnace and air conditioner ensures all-weather comfort. This trailer also includes higher-end amenities such as an oven and range top, porcelain toilet, and electric water heater. Made as Lightweight, yet offers full luxury of home....Lance 2295! The Lance 2295 offers something not many other travel trailers have: an optional fireplace. Though it features a slide-out that is nearly 7' long, the fiberglass and aluminum construction ensures that the weight of this trailer is only 4,185 pounds. At 27 feet, the Lance 2295 feels surprisingly roomy, with a walk-around queen bed in the private front bedroom, and a rear bath that even includes a private dressing area and wardrobe. If you choose not to have the fireplace installed, that space will be used for additional storage beneath the 32' rotating LCD TV. 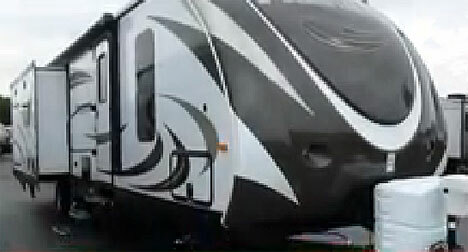 EverGreen has made a name for itself building RVs that are “green certified”. This means that these trailers are made from lightweight recyclable materials that have been certified as environmentally friendly. Their 27' model can have a dry weight as low as 4,400 pounds. One of the things that sets the Ever-Lite trailers apart from others is the ability to choose from eight floor plans, with up to three slide-outs. 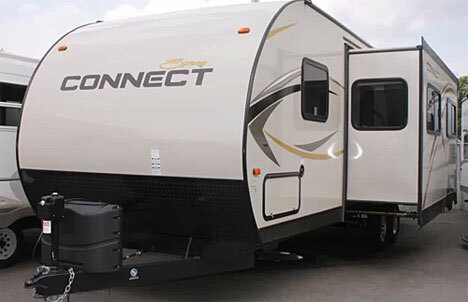 The company in their lite-weight campers also includes amenities such as Corian countertops, solid wood cabinet doors, double-door refrigerators, and crown molding. Keystone Bullet travel trailer looks really like "The Bullet"
The nearly 35' Keystone Bullet Premier model may only be 6,180 pounds, but it is still packed full of all of the features of a full-size RV. With a 36” deep slide-out containing both a convertible dinette and a convertible bed, double-bed bunks in the rear, and a front queen bed, this trailer easily sleeps up to 10 people. Other features include Williamsburg leather furniture, and a full entertainment center that includes a 46” LCD TV. 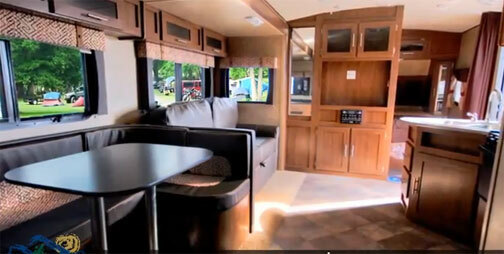 The 36-foot Heartland model has a dry weight of only 6,399 pounds, but it won't leave you wanting. With a rear bunk featuring double queen beds, a sofa/booth dinette, 6 ½ foot ceilings, LCD TV, conventional oven, and dual-ducted air, this travel trailer has the feel of a much larger RV. The trailer manages to keep its weight down thanks to an aluminum and laminated fiberglass construction. Dutchmen pride themselves on offering a number of layouts and high-end amenities you won't see with many other lightweight travel trailers. At only 6,974 pounds, their 35-foot layout includes three Schwintek slide-outs, front bedroom, 1 ½ baths, and two rear bunks. You'd be hard pressed to find a similarly-sized travel trailer that includes so much, including power awnings, and even a king bed in the front bedroom. The KZRV Spree features triple slide-outs and a length just over 34.5'. Still, the company has managed to keep the weight to less than 7,300 pounds, while still offering a number of options. In the LX version, 6'10” ceilings, innerspring mattresses, 32” LED TVs, and more make you feel right at home, even when you're on the road. Other optional amenities include Corian countertops, front and rear stabilizer jacks and an outdoor grill. Forest River offers you a total of 19 floor-plans to choose from in their Rockwood Signature Ultra-Lite series. This includes trailers ranging from 30 to 32 feet, all having dry weights that are less than 7,500 pounds. More than half of their layouts for this series include aerodynamic V-nose front ends, further cutting down on your gas costs. Amenities include Corian countertops, solid wood cabinets, Lazyboy leather recliners, stainless steel appliances, and LCD HDTV with surround sound.